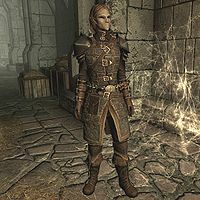 Beleval is a Bosmer bandit and a member of the Dawnguard, who can be found in Fort Dawnguard. Like most other recruits, she is available as a follower, and with Hearthfire installed, she is available as your personal steward. She is clad in a set of Dawnguard heavy equipment. This includes the brown cuirass, as well as matching pairs of gauntlets and boots. She is equipped with a Dawnguard war axe and a crossbow supplemented with fifteen steel bolts. If you are an elf, she will say, "Not a lot of our kind here, I see. Suppose I shouldn't be surprised. Still, those of us here have as much of an obligation to protect Skyrim as any other, wouldn't you agree?" If you are not an elf, she will instead say, "Seems that I'm the only of my kind here. Suppose I shouldn't be surprised. Still, it's my duty to help protect Skyrim as much as any Nord's, don't you think?" You can also ask her why she joined the Dawnguard, to which she will say, "Isran is the only one trying to do something about these vampires. I don't much like him, but I can't allow the people of Skyrim to be preyed upon by those monsters." Beleval is the only female Bosmer follower in the game. Although her default gear is governed by the Heavy Armor skill, Beleval is actually more proficient in Light Armor. This page was last modified on 24 October 2014, at 18:59.